Teresa Reade is the principle and founder of Reade Law Firm, PC. Teresa’s practice focuses on helping people through some of the most difficult times in their lives and changes to their family, including divorce, custody, support and alimony, complex property division, and business and property valuations. 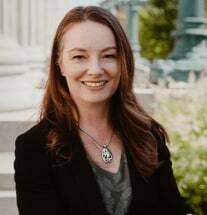 Originally from Wyoming, Teresa attended the University of Wyoming, obtaining a Bachelor of Arts in Administration of Justice before moving to California to attend Pepperdine University, School of Law, where she focused on litigation and trial practice. Teresa received her Juris Doctorate degree in 2000 and began practicing in Los Angeles and Orange County. Teresa handled a broad array of legal matters, gaining substantial experience in all aspects of litigation. Teresa was admitted to Massachusetts in 2009, where she has focused her practice on all aspects of family law matters. Teresa focuses her practice exclusively to issues relating to Family and Divorce Law, including custody and parenting plans, child support and alimony, property division issues including high asset divorces, prenuptial agreements and restraining orders. Teresa acts as appointed counsel for children through the Attorney’s Representing Children (ARC) program and acts as a Guardian Ad Litem. Teresa is actively involved in several attorney organizations including the Essex County Bar Association, Women’s Bar Association, and North Shore Women Lawyer’s Association. Teresa regularly attends continuing legal education seminars to stay current date on all legal developments. Outside of work, Teresa enjoys the outdoors, cooking and spending time with her three children.